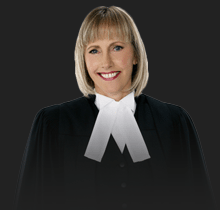 The term employment equity was first introduced in 1984 by Supreme Court of Canada Justice Rosalie Abella in her Royal Commission Report. This report noted that certain groups of people – women, Aboriginal Peoples, visible minorities and persons with disabilities – faced systemic discrimination that kept them from accessing well-paying jobs. The report acknowledged that discrimination was rarely intentional, but that it was nonetheless woven into the very fabric of most businesses’ employment policies and practices. The report did not place blame on any individuals. Rather, it argued that many common and seemingly neutral employer practices around hiring, retaining and promoting employees unintentionally disadvantaged the above-noted groups of people. Therefore, the commission prescribed a systemic solution of employment equity to remedy the disadvantages faced by these groups of people. Justice Abella explained that employment equity is an ongoing process. It requires that we identify and eliminate barriers to people’s full participation in the workplace by enacting positive policies to facilitate their inclusion so that all areas of the workforce reflect broader social demographics. History has shown that, without government oversight and legislation, businesses and organizations are not good at ensuring employment equity on their own. Before employment equity laws were passed, few companies voluntarily evaluated and changed their hiring and employment practices to ensure equitable opportunity for marginalized groups. Following the recommendations of the Abella Report, the purpose of the 1995 Employment Equity Act is “to achieve equality in the workplace” to ensure that no one is denied employment opportunities for reasons other than their ability to fulfil their role’s job requirements. But the Act is about more than meritocracy. It’s about correcting the systemic conditions that disadvantage women, Aboriginal Peoples, visible minorities and persons with disabilities. The Employment Equity Act recognizes that what is fair is not necessarily that which is equal. The Act acknowledges the need to take special measures to remedy past inequities and accommodate differences in order to make the workplace just and accessible to all. Identify and eliminate employment barriers in their employment and workplace policies and practices. Institute positive policies and practices and make reasonable accommodations to ensure designated groups achieve representation across all sectors of their business proportional to these groups’ representation in the overall workforce. To start, employers need to determine the degree to which women, Aboriginal Peoples, visible minorities, and persons with disabilities are underrepresented in all occupational areas of their workforce. For example, since women make up 50% of the population, they should make up roughly 50% of management, 50% of HR, and 50% of sales roles. It is not enough to say that half of your employees are female if none of these female employees are in management positions. Next, employers shall review their policies and practices to identify potential barriers to employment and opportunity (such as promotion) to these groups. For example, a potential barrier to a person with a disability may be the accessibility of your offices or policies prohibiting working off-site. When talking about employment equity, the topic of quotas or affirmative action are often brought forth to suggest that employment equity privileges one group of people by taking away opportunities from another group. This is not the case. Employment equity does not involve hiring quotas or affirmative action. Employment equity is about correcting injustices and creating a level playing field, not favouring one group over another. It simply requires employers to look at their workforce and set goals to make it match the overall composition of the broader workforce over time. Furthermore, employment equity does not require employers to hire unqualified individuals. Employment equity does not hinder employers from setting bona fide qualifications for the job. Employers do not have to hire or promote anyone beyond their demonstrated job abilities. Finally, while employers are expected to make reasonable accommodations to facilitate the full participation of all people in their business, they do not have to incur undue hardship that would negatively impact their operations or business in order to do so. 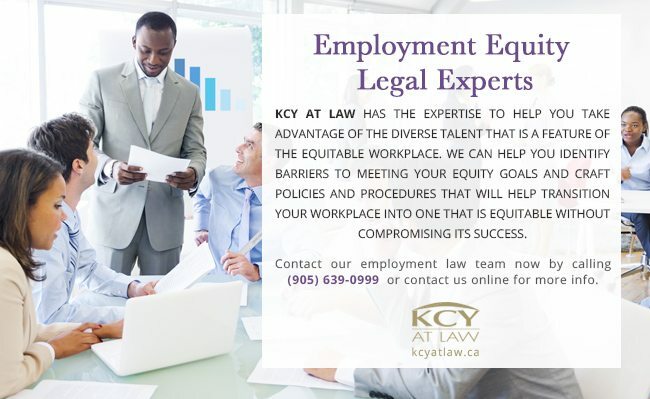 KCY at LAW has the expertise to help you take advantage of the diverse talent that is a feature of the equitable workplace. We can help you identify barriers to meeting your equity goals and craft policies and procedures that will help transition your workplace into one that is equitable without compromising its success. Contact our employment law team now by calling (905) 639-0999 or contact us online for more info.